How to say the rosary ok Here we go! On the 1st bead, say 1 our Father. On the next 3 beads, say Hail Mary’s. Next say 1 Glory Be to the father. Announce the 1st mystery of the selected group (Joyful Mysteries) The angel Gabriel brings the joyful message to Mary. Think of what the mystery means and say 1 our father. Then Say ten Hail Mary’s. And 1 Glory be to the father. Announce the 2nd mystery of the selected group (Joyful Mysteries) Mary visits her cousin Elizabeth. Announce the 3rd mystery of the selected group (Joyful Mysteries) Jesus is born in a stable in Bethlehem. Announce the 4th mystery of the selected group (Joyful Mysteries) Jesus is offered in the temple. Announce the 5th mystery of the selected group (Joyful Mysteries) Jesus is found again in the temple. Announce the 1st mystery of the selected group *(Luminous Mysteries)* The Baptism of Jesus. Announce the 2nd mystery of the selected group (Luminous Mysteries) Jesus Self-Manifestation at Cana. Announce the 3rd mystery of the selected group (Luminous Mysteries) Proclamation of the kingdom of God. Announce the 4th mystery of the selected group (Luminous Mysteries) The transfiguration. Announce the 5th mystery of the selected group (Luminous Mysteries) Institution of the Eucharist. Announce the 1st mystery of the selected group (Sorrowful Mysteries) Jesus prays in agony to his heavenly father. Announce the 2nd mystery of the selected group (Sorrowful Mysteries) Jesus is scoured. Announce the 3rd mystery of the selected group (Sorrowful Mysteries) Jesus is crowned with thorns. Announce the 4th mystery of the selected group (Sorrowful Mysteries) Jesus carries his cross to Calvary. Announce the 5th mystery of the selected group (Sorrowful Mysteries) Jesus dies on the cross. Announce the 1st mystery of the selected group (The glorious mysteries) Jesus rises from death. Think of what the mystery means and say 1 our father.Say ten Hail Mary’s. Announce the 2nd mystery of the selected group (The glorious mysteries) Jesus ascends to Heaven. Announce the 3rd mystery of the selected group (The glorious mysteries) The Holy Spirit descends upon the Apostles. Announce the 4th mystery of the selected group (The glorious mysteries) Mary is taken up to haven in body and soul. 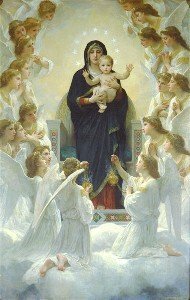 Announce the 5th mystery of the selected group (The glorious mysteries) Mary is crowned in Heaven. Now you should say the prayer after the rosary witch was added to the mysteries of the rosary by Pope John Paul ll in his Apostolic letter of October 16th 2002, entitled The Rosary of the Virgin Mary. And finally we say the Rosary Novena Prayer witch should be said with or after the Rosary. I hope " how to say the rosary " has helped you learn or brush up on your Rosary please vist my payer list to learn more prayers. Would you like to help my site?